ACT-products are suitable for different soft shell fruits (berries and others ). For every need, there is a product designed solution. The operation of each product based on the same patented technology. Ethylene is a naturally-occurring growth hormone that is for instance produced by most fruits during the ripening process. The high amount of ethylene that is present in the air near these ripening fruits can damage other fruits that are sensitive to the gas. Examples of such damage are for instance the shedding or spotting of leaves and the yellowing, browning or losing of color. Moreover the fruits and vegetables can become soft, lose their taste, get mildew and start rotting earlier. Especially during storage and shipping the presence of ethylene gas can become problematic, since it is produced more excessively in stressful situations such as dark transportation as well as by fruits that are already damaged. Controlling the amount of ethylene gas your fruits are exposed to can increase their expected lifespan. 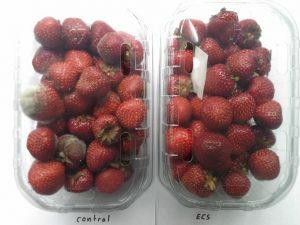 Internal and external tests show that shelf life of fruit is extended with more than 50% ( ±4 days). How sensitive is your fruit?